Originally posted on the Al-Jazeerah website. This translation of a televised conversation reveals a rare glimpse into the outlook of Muslim scholars who are concerned about Christianity’s growth. The invited guest is Sheikh Ahmad Al Katani; the president of The Companions Lighthouse for the Science of Islamic Law in Libya, which is an institution specializing in graduating imams and Islamic preachers. The truth is, the institution that I administer is considered pre-college. As for the subject of attracting and preparing specialized missionaries to bring them from their countries to Libya in order to train them and return them back to their countries, that is done through the Islamic Propagation Organization. This organization has graduated a number of classes, some of whose students had masters and doctorate degrees. These efforts were fruitful in that these graduates were able to attract people from their lands and countries because they spoke the language and understood the customs of the people they were proselytizing. This way, the missionary is not a foreigner to the community he is working with, contrast that to what would happen if I went to the Philippines for example. I can’t speak a single Philippino word; much less invite people to the faith. My brother may Allah reward you. We muslims in Holland suffer a lot when we see issues like this and we really suffer when we see a muslim, as the sheikh said, who spends millions in bars and entertainment while other muslims are lost and cannot find a translation of the Koran. Even their children who are able to learn cannot memorize the Koran, they can’t find a translated Koran or even any translated book. The first thing we must do is mend our selves; the Islamic countries must fix themselves first and then they can look at Africa. May Allah reward you and this issue is interesting. Later, an Arabic-speaking Christian discusses how Islam must preach peace and love. No one denies, as none of the Muslim scholars do, that a religion has the right to spread his faith (except in hard line Islamic countries), but these leaders seem panicky. They express frustration at Islam’s disorganized efforts to maintain Africa. But this one idea eludes them: Islam itself is the problem because it is a burdensome and harsh religion. This is apparent when one Muslim scholar talks about implementing Shari’ah as if it is self-evident that it benefits society. Our topic this evening will be Christianization in the Dark Continent … Africa. For after Islam was the religion of the majority, the great majority of that continent, the number of Muslims now is no greater than a third of the population. This is taking into consideration, of course, that a large portion of this group are Arab Muslims. No doubt that the missions of evangelization and Christianization played a great role in this demographic shift of Muslims in the continent. To discuss this topic, it is my pleasure to introduce today a man who is an expert on the issue of evangelization and Christianization in Africa, even though he will concentrate on the issue of Christianization first and foremost … . Sheikh Ahmad Al Katani; the president of The Companions Lighthouse for the Science of Islamic Law in Libya, which is an institution specializing in graduating imams and Islamic preachers. Maher Abdallah:If we start by inquiring about your strict stance against the Christian missions in Africa, don’t the followers of every religion have the right to seek new converts, exactly as you train and graduate young Muslims to propagate Islam? Ahmad Al Katani: I seek refuge in Allah the Seer, the Knower, from the stoned devil. In the name of Allah the Merciful the Beneficent. Thanks to Allah the One, the Only, the Permanent One, who did not give birth nor was born, to whom no one was equal. I bear witness that there is no God but Allah who has no partners, and I bear witness that our master Muhammed — Allah’s prayers and peace be upon him – is his messenger and seal of prophets; Allah prayers be upon him and his brothers the prophets and messengers and their families. Ahmad Al Katani: Great (question)! The other religions are not placed on the list of Christianization; rather they are placed on the list of evangelization. The other religion in Africa is paganism; so it’s Islam, Christianity or paganism. There isn’t something similar to Asia for example where you have Buddhism or Zoroastrianism. In Africa it is just these three, so if you talk about Christianization then it targets the only other heavenly religion which is Islam. As for paganism, those people worship animals and planets and the like. Ahmad Al Katani: Every year … In the African nations this century a tragedy happened. Take for example what happened in Ethiopia. Ethiopia is an Arab nation and I am not saying a muslim nation. If any student looks up the word Habasha (Ethiopia) in the book Ocean Dictionary written by Al-Fairuz Abady, he will find that the word Habashat means “people of different tribes” and this is what happened. Ethiopia was a place where Arabs from different tribes would go to live for a while. We all know that Islam entered Ethiopia before Islam entered the city of Medina. We all know that AL-Najashy (the ruler of Ethiopia) was a Muslim. It is mentioned by Al-Darkatny in his biography of the prophet — Allah’s prayer and peace be upon him — that during the month of Rajab in the 9th year of the Hijra (Muslim calendar) that the prophet said to his companions: “Rise up and pray on your brother Al-Najashy.” From that year on the practice of praying on the absent was established. Therefore from the time of the prophet — Allah’s prayer and peace be upon him — Islam entered Ethiopia. So what has happened to Ethiopia? Our sir, you mentioned that there are advantages being taken of necessities: poverty, ignorance; what you mentioned then are waves of elimination, waves of religious eradication, and there is no need to call is racial eradication … .. However, let us go back to the topic necessity and exploitation. This may have all been in the past; the military expeditions that you spoke of were all in the beginning or middle of the last century, but what is happening today in regards to exploiting necessities? Ahmad Al Katani: You know that the current laws forbid trading in slaves, but I can’t find another expression to use. The man asked (from the country of Belgium) approximately forty million dollars or slightly less and it (Belgium) hurried in sending the money to him out of fear that this opportunity will be lost. Belgium sent the money in a very short time, and he (the missionary) paid this money to the parents of the youth and I can only call it buying and selling, there is no other name for it. The result was that 30,000 children were made Christian and baptized in the churches. I say this with all regret, but these children are now adults. This event occurred a number of years ago and these youth are now adults and what is more dangerous is that these people will return to their families; some of them have already returned indeed and others will return. This tragedy happened in Somalia, people’s poverty was taken advantage of and this humiliation happened in front of the eyes of on lookers. Maher Abdallah: Fine! Another picture of taking advantage, this was in consideration of Somalia’s state during war; in the case of a tragedy such as poverty where people were forced to do so due to the circumstances in the area. But what about other regions, how are they doing? Maher Abdallah: If you permit, I do know a group of organizations, whose names I don’t want to mention, which reside in Africa and have headquarters in Tanzania. Maher Abdallah: No! Allow me please. I agree with the difference you pointed to, however if there are some taking advantage of people’s hunger and poverty then these organizations fulfill these needs. In an indirect way they become missionary efforts also by preventing people from converting to Christianity. Ahmad Al Katani: Look sir. Unfortunately, our organizations work in a disorganized method. Have you heard, and I know you have an extensive history in the Islamic field by meeting with scholars, have you heard of a Christian religion that follows Germany or Holland? All have left the work for the Vatican, who has been given the leadership to Christianize. We have a number of Arab countries, each trying to call others to it’s religion and what is happening is that these organizations work independently so if any have done well, it is because of individual effort. My dear sir, in one year, these Christian missionary organizations collected 194 billion dollars. The national budget of all Arab countries combined don’t equal that number. So what is a single Muslim organization in Libya or Egypt or in Kuwait to do? This type of matter should be planned and done collectively. Take another issue, the Christians and the missionaries in particular take a child from his infancy to a school, and from the school to an academy or from an academy to college. If the child ever gets ill, then there is a hospital that they have prepared for him where Jesus will heal him. They deal with him from childhood to adulthood so he never leaves Christianity. As for us, all that happens is that a Muslim humanitarian organization provides some aid for a while as a result of some catastrophe, and I know tens of people like this who convert to Islam a result of the aid, but when the need is gone they revert back to Christianity or to paganism; meaning we are not organized. Maher Abdallah: Let me ask you in this regard. I appreciate that the organizations of the civil societies in our part of the world are rather recent, and perhaps they haven’t matured to the point of becoming streamlined, but what about the Arab nations? Some Arab nations boast about the amount of money they spend in the cause of spreading Islam, especially in Africa. Is there a unified official Arab effort? Official meaning on a governmental level? My honored sir, you have to build the worshipper before you build the mosque. What should happen is that schools should be built first, which are the primary source of spreading Islam and to protect the Muslim using education not a mosque building. The mosque will come as a secondary stage. This is one of the mistakes that we commit; we are proud of building a mosque for example in Dar Al Salam, but believe me my dear sir, had we used that money to build a school it would have been a lot more beneficial. Build the worshipper before you build the mosque and the prophet — Allah’s prayers and peace be upon him — spent ten years of his ministry without building a mosque, but instead he was preparing men. After the prophet entered the second stage of his ministry he built a mosque. I will give you an example and proof that would make the Muslim missionary dangle his head with shame. Kenya’s population, for example, is thirty million people, a quarter of whom are Muslim. In all of Kenya, there are 900 mosques compared to 25 thousand churches. Do you see this great difference? Also, half of these mosques, and I am only calling them mosques out of pity, are unusable. They have roofs made out of reeds and the like, whereas you look at the churches and you find great amounts of money spent on them. In these churches they raise orphans while we Muslims are not complaining about the care of orphans because the topic we are discussing is taking advantage of the humanitarian needs to take Muslims out of their religion and into Christianity. Ahmad Al Katani: When it come to the wealthy Arabs and Muslims we are in great shape. We are talking about individual Arabs and I am not talking about entire Arab nations, the wealth of the individual Arabs can be estimated at around 600 billion dollars. So if we assume that these people pay the religious contribution known as Zakat (2.5% of income) that gives us 15 billion dollars annually. I am sure that if this religious contribution was gathered and given to the Muslim missionary groups that know how to work well, then we will not leave a place in Africa for Christians to have any missionary activity. The problem with the wealthy Arab is that he doesn’t direct his effort to the Islamic cause at all, while in Europe all the income that the churches receive is from individual contributions. When it comes to having wealthy Arabs, we are doing fine. However, it seems that these wealthy Arabs don’t care about these issues at all; knowing that a quarter of the religious contributions should go to those whose hearts can be swayed. This was done during the days of the prophets — Allah’s prayers and peace be upon him. However, the rightly guided caliph Omar stopped this practice. When Islam gained a lot of adherents, the caliph Omar stopped spending money on those whose hearts can be swayed. Now in Africa there are rulers of tribes, kings of tribes who have a lot of influence on their followers, so what is stopping us these days from using some of the religious contribution to spend on these types of people over there? When it comes to the wealthy Arab, he either doesn’t care about these issues at all, or he is concerned about other issues. Are you aware, my dear sir, that a wealthy Arab built a palace in London worth seven million dollars? If this man had given us just one million dollars we would have spent it in the correct manner. Maher Abdallah: Allow us to focus our discussion on the wealthy Arab who is interested in propagating the Islamic message. There are wealthy Arabs who are occupied with other matters as well; that is their prerogative and a different matter. However, from talking to some Muslim missionaries in Europe and Africa, I get the impression that the would be easy for someone like that to deal with you when it comes to building a mosque. You may have trouble in convincing him to … . What is happening these days is that there are many sects on the playing field now, many groups who disagree between each other and you know this well. I don’t want to delve into this topic because it has become boring and tiresome. In Ghana for example, you know that the African is unable to grow a beard, hair growth on the African face is very light. Ahmad Al Katani: The truth is, the institution that I administer is considered pre-college. As for the subject of attracting and preparing specialized missionaries to bring them from their countries to Libya in order to train them and return them back to their countries, that is done through the Islamic Propagation Organization. This organization has graduated a number of classes, some of whose students had masters and doctorate degrees. These efforts were fruitful in that these graduates were able to attract people from their lands and countries because they spoke the language and understood the customs of the people they were proselytizing. This way, the missionary is not a foreigner to the community he is working with, contrast that to what would happen if I went to the Philippines for example. I can’t speak a single Philippino word; much less invite people to the faith. Maher Abdallah: Even the Philippines? Allow me to share with you a story that a muslim Indian missionary, who was fluent in Arabic, told me. He said that during his 9 year stay in Africa in a region I can’t recall, perhaps it was the Ivory Coast, the issue of temporary marriages was problematic because the Africans don’t understand it the same way we do. A woman who fell in love with a man would go live with him without initiating a lawful contract. As a matter of fact, in Ramadan, which is Holy to Allah, the women would go live in the house with the man’s family. When some of the inhabitants of that area returned home after studying in different Arab countries, the first thing they did was wage war on these families using the excuse that these types of relationships (weddings) are not lawful and all children born in such relationships are illegitimate. Ahmad Al Katani: My dear sir, the majority of the companions of the prophet were married prior to Islam and then they converted. We never heard at all, nor read anywhere or learned at all that the prophet — may Allah be please with him — ordered any of the companions to re-perform their marriage ceremony. He accepted them all, knowing full well that their marriages were conducted according to the rituals of the days if ignorance and some of them had up to 10 wives, some of them would marry two sisters. The prophet did not allow more than 4 wives and asked any man married to two sisters to choose between one of them but he kept the marriage as is. As for marriages after the advent of Islam, that is another matter. There are rules and dowries and a guardian, but before Islam the prophet kept things as they were. Likewise these people that you mentioned my dear sir, we seem to live with a dual mentality. We think that a muslim in Botswana or Congo or the Philippines or Venezuela is the same as a muslim living in Tripoli … and that’s a mistake. There are sensitivities that must be accommodated. I live near a mosque, my father and grandfather are both muslims, but these people live in a different situation and we must understand their circumstances and take that into consideration. 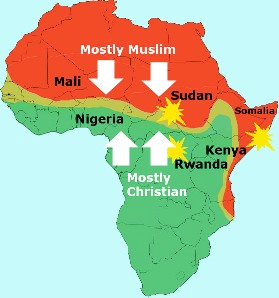 The west prepares missionaries and evangelists and sends them to Africa to transfer the western lifestyle to Africa. The western lifestyle, my dear sir, means infusing immorality among the people spreading many diseases that Africa currently ails from. This has become the greatest concern for Europeans and westerners right now, to the point that they say it in English “Africa is out”, meaning there is no more use for Africa. Finally brother Maher, I heard at one point that you intended to re-broadcast the program “Islamic Law and Life” that was to be translated and until now we haven’t noticed that this project has seen the light of day. I insist that it is an obligation for all satellite channels to air Islamic programs in foreign languages so that Islam can reach every spot on earth. Thank you and Allah reward you. Ahmad Al Katani: There is a religious decree issued from muslim regions that allows a woman living in non –Islamic countries to go to work unveiled so that her sustenance is not cut off and she doesn’t become in need. This is the lesser of two evils. Maher Abdallah: Alright. We request that all future questions address the heart of the topic which, as you know, is a horrible hemorrhage that the muslim community is suffering from. We realize that this episode and other episodes won’t do the topic justice, so we urge you to concentrate on the topic. Sheikh Ahmad, your comments of the brother’s question. Ahmad Al Katani: Abdel Rahman from the Emirates. My dear brother you mentioned that you receive these printed material in El Sharika. I know this very well and frankly the issue of evangelization requires a long time and I suggested to Mr. Abu Usamah that our topic today be about Christianization in Africa. As for Christianization of Arab countries, Asia, Europe, the Americas and Australia then this will require other episodes. We honestly won’t be able to give all the topics their due time, but consider the following. Ahmad Al Katani: Yes Upper Egypt. This organization has 60 branches to evangelize Egypt. Also, in a country like Mauritania, which is a muslim Arab state whose population of 2.5 million people are all muslim, has a organizations like the American (Delolise) Society, the Global Royal organization, the Carrots organization, the Mauritanian Hope Association, the Population Growth organization, the Evangelical Arab Union, all these are missionary groups in Mauritania. There is no Arab country that is excluded from the list of evangelization. My dear brother, in Malaysia there are 500 evangelizing organizations but I don’t want to leave the topic of Africa so please forgive me brother Abdel Rahamn. Ahmad Al Katani: Yes sir. He mentioned two important points; depleting the continent of Africans and it is known that Portugal was the first western nation to enter into Africa in the year 1442 A.D. and took ten black Africans to Europe. This was the birth date of the African slave trade. From that time and until today, one third of the Africans live outside Africa, meaning that if we assume that an African family has nine members then three of them now live outside Africa. Truly, Europe wants Africa without the Africans since they pose a heavy burden. As a matter of fact, there is a professor by the name of Paul Arlitch from the University of Stanford who suggested a while ago that the grain exported to African nations should be mixed with birth control pills in order to empty Africa out of it’s inhabitants. Maher Abdallah: (Laughing) He has asked another question. He mentioned another point that the evangelist comes to Africa aided with a successful European image, so it is as though he is saying to the Africans “come join us. You have now joined the rest of the world”, whereas there is no grand Islamic image that could be considered attractive. Ahmad Al Katani: True, True. This is a correct saying and I really don’t have a response. I cannot say more than this. Maher Abdallah: OK, if we return to our topic; you mentioned that some Africans, and I saw some Africans who would fast and pray with us in Europe, who did not know that fornication is not allowed, or think that if the girlfriend is monogamous then this can be categorized as … . Maher Abdallah: Categorized as allowed. So this is one issue actually opens another door which is that it is not enough to invite people to Islam but you must educate the muslims with what they must know, what is commonly called “That which is necessarily known in religion.” For example, the issue of fornication should be elementary. Ahmad Al Katani: My honored sir, with all regret and pain we have failed in creating an upright muslim in the Arab nations. A while ago, the French newspaper “Le figaro” published a very strange and disturbing article which said that a wealthy Arab lost 85 million dollars in one night on the gambling tables and that’s not all. He even gave the waitresses a one million dollar tip. We did not create an upright muslim. In England there is an association called “Mecca” and I repeat the name “Mecca” that is a gambling house. It has 135 branches all over England and the majority of its customers are Arabs. We did not create a muslim who can be considered a good example in our own Arab lands, so how can we do this in foreign lands? We live in a tragedy my sir, I swear by Allah we are living in a tragedy. Abbas Hamid: My brother my Allah reward you. We muslims in Holland suffer a lot when we see issues like this and we really suffer when we see a muslim, as the sheikh said, who spends millions in bars and entertainment while other muslims are lost and cannot find a translation of the Koran. Even their children who are able to learn cannot memorize the Koran, they can’t find a translated Koran or even any translated book. The first thing we must do is mend our selves; the Islamic countries must fix themselves first and then they can look at Africa. May Allah reward you and this issue is interesting. Mohammed EL Shami: My dear sir, talking about Christianization requires an understanding of Islam and Christianity in a detailed way. There is a huge difference the between Islamic doctrine and Christian doctrine. Islamic doctrine is simple, clear and convincing. Christian doctrine is mysterious, complicated and full of contradiction. So the cause of the problem is the careless attitude on the part of muslims, especially from the governing bodies that are responsible for the welfare of muslims. If it wasn’t for the ignorance of the muslims of their own religion, a complicated doctrine such as Christianity would not have found a place to set foot on Islamic soil. Had it not been for poverty and the condition of the muslims, Christian schools and hospitals would not have flourished. This is primarily the responsibility of the nations to confront the Christian missionary activity, not by giving aid or individual effort or humanitarian relief organizations but by the leadership in the Islamic world who should adopt Islam as a way to live and a path for life. They must teach Islam and invite others to it and prevent Christian missionary activities. One cannot treat a disease by allowing the virus that caused it to remain in the body and spread its poison. Unless we do this, we cannot confront Christianization. George Khoury: I would like to address the reverend Sheikh, he appears to be a learned expert, however I wish the program would have had a Nazarene or Christian person on the show to respond to the Sheikh’s comments. First of all, Christianization of Africa: our Christianity requires us to love and live in peace. At the same time we are required to rescue the overwhelmed, aid the helpless; love and charity are the most important things in our religion. As a Christian living in the Middle East, I have not noticed persecution of Christianity; rather, the persecution is of muslims towards other muslims. As proof of this, the majority of Arab rulers or religious figures or owners of wealth in the Persian Gulf or Arab nations try to establish projects in Europe using their money, or attempt to destroy other political ruling systems and they leave their Islam. This opposes the law, even Islamic law. So I request from the honorable sheikh that first thing he does is prepare muslim religious leaders and sons of the muslim community who will spread love and peace. I only see the murderous Muslim Brotherhood groups, the terrorists and the like who contradict the Islamic religion in the Middle East. The prophet commanded brotherly love and asked people to take care of the seventh and even the fortieth neighbor. He even said if you were grilling a chicken on the coals and you neighbor smelt its aroma, then you have harmed him (by making him hungry). As muslims, you must give half of this food to your neighbor, but with all regret, I haven’t noticed this in the Middle East. Ahmad Al Katani: George, to start off I would like to thank you for your etiquette and your pleasant manner that you spoke with. Secondly, I don’t blame the Christians and I personally have many Christian friends; I respect them and they respect me and I would like to add you to that list if you don’t mind. Thirdly, I have not talked and Allah willing, I will not talk about Christianity as a religion. I am talking about Christianization, which is taking muslims out of Islam by taking advantage of certain circumstances and making them Christian. As for your saying that the Middle East is bloody with murder committed by the Muslim brotherhood, and you can even say that “The Part of Allah — Hezbolla” commits these acts, I know all what is said, this is not true. This type of talk, if you don’t mind me saying, is simply untrue. Please allow me to say this and accept what I am about to say, that there isn’t in the world anyone who sheds more blood than the Christians. You are an exception; you and pure people like yourself. For example, you are aware that mixed marriages between Catholics, Protestants and Orthodox are not conducted. Can there be any more separation than this? You also know what happened when the French Catholics annihilated thousands of Protestants. You also know that John F. Kennedy, the only Catholic to be elected a U.S. President was assassinated because he was a Catholic. You are also aware that Nicaragua, which is a Catholic Christian nation, executed six missionary monks even though the Pope was intending to visit that country and he did visit it. You are also aware that in Ireland today battles are waged everyday, killing every day, to the point that even children are killing children between Catholics and Protestants. My dear sir, we muslims don’t have such things, we don’t have it at all. However, you are an exception. I know who I am addressing this to, not to you or to pure gentle people like yourself. Uthman Naser: Peace to you. I thank the AL Jazeera network for giving the opportunity to air an enlightening programs like this, so that a muslim can be made aware (of these issues). This is in line with what the prophet said, “He who is not concerned with the welfare of the muslims is not one of them.” I would also like to thank the honored sheikh and you brother Maher. We know that the Christians all over the world permeate poison into everything that is good and they do not hesitate to develop diabolical plans against the muslims. My question in short is this: Did the Pope’s recent visit (to the Middle East) have anything to do with the Christianization missions or was it, as we heard, a visit to help the Arab and muslim needs, considering that the Pope visited the Aqsa mosque in Jerusalem. Or was this a preparation for future plans. Awad Ahmed Ashra: (Sorry) two billion, two billion. It seems that this massive amount of money is spent on Islamic countries, especially Somalia, under the guise of humanitarian relief organizations. There are over 21 similar organizations such as “Welfshine” and “Convine” and many others. They have started broadcasting Bible programming from two radio stations with the intention of proselytizing and evangelizing. One station broadcasts in the Somali language from Kenya and the other from Shesham. It seems that in most of these nations Islam had spread first so the missionary groups moved in and replaced Islam. All these lands, including Kenya, use the Swahili language, 70% of which is Arabic. Islam even reached Mozambique. As a matter of fact, the grandfather of that republic’s first president was a muslim, who later became an apostate and left Islam. Most of Africa was divided according to the Berlin Accord of 1884 A.D. and the west has been using missionary activities as the first step for entering into Africa. Ever since then, the missionary and Christianization activities have been progressing hand and foot into Africa. Maher Abdallah: Thank you very much brother Awad. I believe your question — Allah willing — is very clear and the honored sheikh will answer you. However, allow me first to return to return to the question that Mr. George asked. Sheikh Ahmed, you answered a part of his question but there is another part. He mentioned the part about muslims persecuting other muslims and the lack of the spirit of love and peace from the call to Islam. Is this an essential trait for the success of the missionary? Ahmad Al Katani: By Allah, George is correct and I am with him on this. The Islamic groups that we have today, and please forgive me for what I am about to say and I take full responsibility for it, I fear that there are treacherous hands controlling the decisions of the Islamic groups. I don’t consider myself an expert on these groups, but according to what I know, these people have concentrated on the outer garment but have abandoned the person inside the garment. They have problems, rivalries, envy and opposition to each other; each one of these groups is accusing the other of apostatizing. They have fought and left the truth. Instead of all this, plans should be established by the Islamic organizations to start the humanitarian work of propagating the Islamic faith, the religion of Allah, and to teach the people and make them understand. Honestly, I put my voice beside George’s on this issue and I say to him, “You are correct.” There are many warring groups who are envious of each other and who exchange insults and accusations of apostasy without just cause. I raise my voice with his. Maher Abdallah: Alright! If we return to Mohammed Al Shami’s question that a person needs to understand the religion very precisely and at the end of his question he said that it is the responsibility of the nations first and foremost and not the responsibility of individual groups and organizations. Do you agree with him? Maher Abdallah: How about the brother’s question regarding the Pope’s visit, does it have anything to do with Christianization efforts that are occurring in Africa? Or is it simply a spiritual trip for a spiritual leader who has faithful in the area? Ahmad Al Katani: Dear Abu Usamah and to the inquirer Uthman I say the following: the Pope does not make a move unless it have been studies very, very carefully. In 1982, the Pope declared in an area called Campo Steel in Spain that it was time to re-evangelize the world. Of course, re-evangelizing the world means evangelizing the muslims. You may ask: what does Campo Steel mean and where is Campo Steel? Campo Steel is the last point that the Islamic forces reached in Andalusia (muslim Spain). So the Pope stood in that location and declared that he will initiate the plans to reverse (this Islamic expansion). So don’t expect that the Pope’s plans are purely religious as he claims. We come to your statement that the Pope visited the Aqsa Mosque which can be considered as a type of admission that the Arabs and Moslems have rights over there. I was very surprised when other Arabic satellite stations were stating that the Pope’s visit to the Aqsa Mosque in Jerusalem was to encourage and support the Arabs in their struggle for rights in Jerusalem. My dear sir, if you wanted to use this kind of logic, then don’t speak with one jaw, use both jaws (meaning look at both sides of the issue). Take into consideration the Pope’s visit to Nazareth accompanied by high ranking Israeli officials. This is an admission on his part that Jews have rights in Nazareth. But the Arab media concealed his trip to Nazareth and concentrated on his trip to the Aqsa Mosque. Another issue to consider is that before the Pope visited Israel, he apologized both verbally and in writing to the Jews. For the first time in history he apologizes to the Jews, the very people who say that Jesus is an infidel and an apostate — we seek refuge from Allah form such blasphemy. The Jews also talk about Mary, the Mother of Jesus, and describe her as an adulteress. Mary is mentioned in our Koran with the following words, “And the angels said O Mary! Allah has chosen you and purified you and chosen you from among the women of the world”. With all this, when the Pope decided to come to Palestine, none of the high ranking rabbis were present to receive him, they (the Jews) also broke the runway on which his plane was to land, they wrote signs expressing their rejection of his visit and they even held prayers in which they damned and cursed him. We are a people who don’t know moderation … . We take everything now, forgetting the world to come and the grave. We all love and we all hate, but despite all this the rabbis refused to visit him. We, as Arabs, have not heard that any Arab nation refused to welcome the Pope. The enthusiasm even reached the point where a high ranking Arab official – who shall remain nameless — kissed the Pope’s hand. Maher Abdallah: Alright … Let us return to our viewers, we have a number of people on the lines. Brother Ahmed Kalul in Britain go ahead. Ahmed Kalul: Peace be upon you and a greeting to the Al Jazeera channel. Let me make a quick comment concerning the Christianization operations. I wish that we make a distinction between the Church in the Vatican that evangelizes and the common Christians, specifically the Arab Christians, whose history and situation inside the Islamic world is distinct from the church that was connected with the imperial Roman power. This is the same church that allied itself in recent times with occupational nations (forces). The droves of Christian missionaries would be the first troops who precede the invasion forces. This means that the missionaries were similar to look-out scouts who would come in and prepare that land by building roads for the invaders to use, and there are many documents that prove these actions such as the French invasions. 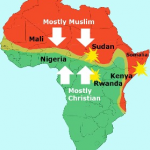 Also, with regards to the Christianization of Africa, and here I will mention North Africa, the Church believes that these lands were forcibly taken away from it by muslims and that it has succeeded in returning Andalusia (Southern Spain) to the Church’s fold. They (the Church and the west) have also tried to occupy Tunisia for forty years, for example, and the horse’s hooves trampled on the Koran and other Islamic books among many other acts. When the French occupation entered these lands, the French considered it the ninth crusade. Usamah Abu Korak: Mr. Maher and Sheikh Al-Katani, we thank the sheikh for his work as an intellectual warrior … my question is: Doesn’t the honorable sheikh feel that the best solution to this problem would be to invade these people in their land, by concentrating on the propagation of Islam in Europe and America? I don’t know what the sheikh’s efforts are in Africa, but what does he think about this idea; to concentrate on their countries and propagate the message (of Islam)? Thank you very much and peace unto you. Maher Abdallah: (interrupting) Brother Munthir… thank you very much for this comment, we believe it to be an important question and if Allah wills, you will hear the sheikh’s response to it. Sheikh Ahmad, if we return to the first question that brother Ahmad Kalul posed; I suppose that he was very logical in his appeal and wish for you to differentiate between the church as an organization and ordinary Christians, especially those who live among us. Do you see a need for this distinction? Ahmad Al Katani: I believe I said at the beginning of this program that we are talking about Christianization, and Christianization is only performed by the Church. As for individual Christians, especially Arab Christians, I will relate an incident to you that occurred during the Fatimid caliphate in Egypt. There is a book titled “The Lesson regarding the news of Egypt and Cairo” written by Imam Suwuti, who died in the year 911 Hijra so about 5 or 6 centuries ago. The Fatimid caliph had two ministers, one a Christian by the name of “Isa son of Nestor” and the other was a Jew by the name of “Misha”. I am mentioning this story to show the strong bonds that we have with our Christian brothers, for we lived in the same land, fought the same enemy, lived the same life and ate the same food. So there is no difference between us and them and this show the strength of the old bonds. As I was saying the Fatimid Caliph has had two ministers, Isa son of Nestor who was a Christian and Misha who was a Jew. This resulted in the first minister looking after the affairs of the Christians and the second looking after the affairs of the Jews and they both neglected the affairs of the muslims. So a muslim women wrote a letter to the caliph saying, “To him who honored the Christians with Isa son of Nestor and honored the Jews with Mesha and humiliated the muslims with you O caliph. You have not resolved my problem”. Brother Usamah Abu Kura also mentioned the idea of invading Europe with Islam. Mr. Usamah, don’t believe all that is said and published, and let’s take America for example. Islam has been in a country like America for 125 years, so do you know how many muslims are in America now? 7 million people and yet we lose 6 million muslims every year in Africa. So the picture is not as pretty as some media sources like to present. The truth is that the picture is very depressing and I fear that one day we may be overshadowed by a great darkness where we do not find Islam in Africa or anywhere else. Maher Abdallah: To be fair to brother Usamah, he didn’t mention anything about a pretty picture; he merely suggested that part of the solution might not only be to stop the bleeding but to also invade, using his word, Europe and America with the call to Islam. Maher Abdallah: Since you mentioned this topic, I will postpone brother Munthir’s question till we answer the following: since you mentioned Holland and Indonesia and the size of the force and effort, in brief, how do you assess the force of the missionary effort as it stands today in Africa? Number of times the name “Jesus Christ” appeared as a missionary message not just a religious one: 1,500; that’s an average of 4 times a day. Ahmad Al Katani: The muslims’ capability is non existent to be honest. That is why is was not surprising to hear Robert Marks, a very famous missionary from the USA, say that evangelizing muslims will not stop until the Cross is raised in the skies of Mecca and the Sunday mass is conducted in the city of Medina. This will happen if the current trend continues and Arab muslims deliberately close of their ears and the eyes. I fear that it will happen and the Arabs will have to face the historical consequences just as their forefathers did towards Islam. The picture is very dark and people should not listen to other opinions that say otherwise, for that would only be done to fool people’s minds. Muhammad Rashid: Peace be upon you. I hope you are well. Sheikh Ahmad, by Allah we have watched a lot of debates on television and we hear a lot of criticism of Christians and muslims but the Might and Exalted (Allah) says in his glorious book (the Koran), “Allah does not change in a community until they change what is in themselves,” a blessed verse found in sura “Say O you infidels.” At the end of this sura Allah says, “You have your religion and I have my religion.” Of course the world is filled with Christianity, communism, Judaism and Islam, so instead of concentrating on Christianization only why don’t we concentrate on Islam and spreading the Islamic message in pleasant way. Christianity tries to collect money to evangelize and we can’t combat evangelization before we try, as much as possible, to propagate Islam on a larger scale, with greater funds. Of course here in the Arab world there exists Christianity, communism and the Islamic religion and we don’t want to create chaos in all these countries by concentrating on Christianity only. Our muslim leaders should educate us with better Islamic teachings so that we may live in a forgiving environment and can concentrate of nationalism only in these countries. Thus we can consider this person as a citizen with a religion and the muslim is also a citizen with a religion. Thank you. Peace be upon you. By Allah brother Maher a person doesn’t know where to start or what to talk about. Sheikh Ahmad you addressed the Christian by calling him brother, by Allah the Lord of the worlds who said, “But the believers are brothers,” this is one thing … . He is your brother in humanity my sir, a brother in humanity. You are a brother to him in humanity and humanity is a domain that encompasses us all. He did not forbid you from, show me where he forbade you. This is the heart of the issue! What is the divine legal solution to this issue that Allah has prescribed on the community that believes in ‘No god but Allah’? Maher Abdallah: I will ask the question that brother Munthir posed, and I believe it is an important question, as I have stated earlier. We will conclude with an important point, and it is my impression that this gentleman believes this is the effective solution. Sir, if this is your question then I thank you for your comment and Allah willing we will hear the sheikh’s response to the question. We have with us brother Ibrahim Siam from Palestine. Ahmad Al Katani: Brother Abu Usamah. We must be realistic with what is present. There exists today 57 Islamic countries and we must collaborate with them. If these countries want to be truly Islamic and do so by legitimate means then wonderful. However, if they try to accomplish this by force, heroism, revolutions and bloodshed then I much prefer the divided nations that exist today over the caliphate whose outcome is unknown. We all know what has happened in the past and I don’t want to go into great detail.